Instead of cash, customers want options when it comes to how they pay. 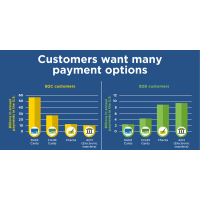 A study conducted by the Federal Reserve shows that Business to Consumer (B2C) customers spent $105.3 billion on noncash payments while Business to Business (B2B) customers spent $24.6 billion. Among the B2C customers, the majority preferred debit cards, to the tune of $57.4 billion. Meanwhile, in the B2B sector, ACH electronic bank transfers at $9.6 billion were the most common form of cashless payment followed closely by checks at $8.7 billion. Credit cards were used modestly by both sectors, with $26.9 billion being spent by B2C customers and $4.1 billion being spent in the B2B arena.